The most beautiful stories and legends come from ancient Greece. Who cares that mythology can contain some inventions? 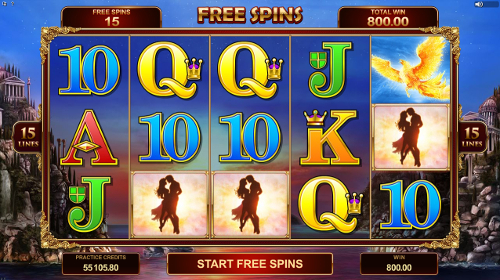 Microgaming shows you a strong and brave man, whose love story makes you get absorbed into this no download adventure. Turn your ordinary day into a real golden rain with 5 reel characters and grab the most attractive winnings. Hey, you have a great chance to take part in Titans of the Sun – Hyperion Slot Machine and get to know its heroes. Yeah, Hyperion himself is already well known, how about his wife and the Couple they make? Flying on the 15 line Firebird, you can reach the treasures. The Horse with crest on fire also knows how to take you to richness. Well, everything in this slot is magical. The only thing to do is just to be brave enough and place the highest bet. Only with the help of $1 as a coin value and 10 coins placed a line, you can count on the top gain. Sure, the coin size starts with $0.01, however, when you are armed with $150, it is easier to believe in fortune. 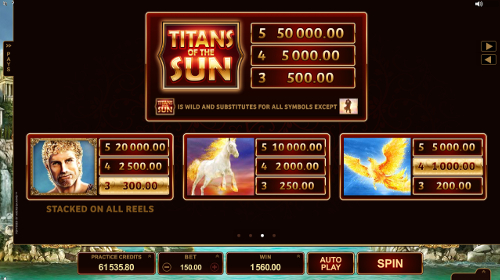 Thus, the highest jackpot is 50,000 coins or $50,000 for 5 Titans of the Sun Logo. The second jackpot is 20,000 coins that is $20,000 for 5 Hyperion. The third jackpot makes 10,000 coins or $10,000 for 5 Horse symbols. Money is the most powerful motivation and has always been so. That is why, as soon as one finds out about the wild symbol, everything changes. 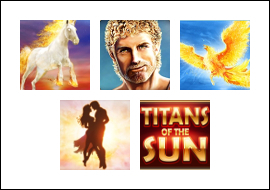 In fact, when you see Titans of the Sun Logo, you can be sure that it will replace the icons, which disturb you to complete a combo. Oh, the girls from Bridesmaids Slots love getting such lucky strikes too. A wonderful Couple standing somewhere among the clouds is just full of passion and fire. Yeah, the scatter symbol allures you with its impulse and this is no wonder. Once you catch from 2 to 5 icons of the figures in any position, your balance automatically gets multiplied by 1x, 5x, 20x or 100x. With the max stake placed, you can collect up to $15,000 without making no combos. Sun is what makes us smile and boosts our spirit. The same things happen in this case and be sure that when you see the icon of Sun on your reels, it is not the end. Here is the moment of Stacked Mystery Symbols, when the figure transforms into any high or low sign and even take the look of the wild symbol during free spins. When it is sunny outside, the weather is nice and there are money splashes on your screen, you start thinking about romance. This is exactly why comes out the Couple and creates the atmosphere of spring. Wait for at least 3 icons to appear and 15 Free Spins will definitely make your day. Hey, you can activate the feature infinitely obtaining more and more scatters. Super warm aura of Greece myths and the feeling that the same can happen in real life. 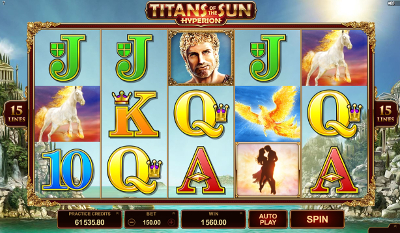 Titans of the Sun – Hyperion Slot Machine wraps you with unspeakable emotions and makes them get more incredible with its generous cash prizes and features.